December 7 -- While the arrival of cut Christmas trees and an all-out Christmas shopping advertising blitz may be producing a large number of children’s letters to Santa Claus, it also is a not-so-subtle reminder to NHRA’s professional racers that the 2012 season will soon begin. Okay, so Feb. 9 is a tad more than 60 days away, but most race teams already have the equipment they need most to prepare for the 52nd annual O’Reilly Auto Parts Nationals at Pomona, Calif.
Oh, and then there’s the essential Jan. 20-21 Winter Pro Warm-up pre-season test sessions for Top Fuel and Funny Car teams at West Palm Beach (Fla.) Raceway. Top Fuel driver Steve Torrence is definitely planning ahead. “We’re doing everything we possibly can to get the shop up and running,” said Torrence of his fledgling Torrence Racing/Capco Contractors Inc. team. “There’s still a lot to be done to get it operating at the capacity we’d like it to be. Richard Hogan (crew chief) has been at the shop (in Brownsburg, Ind.) for a week and the guys are doing well. Those two multi-car teams are very worthy of Torrence’s respect. 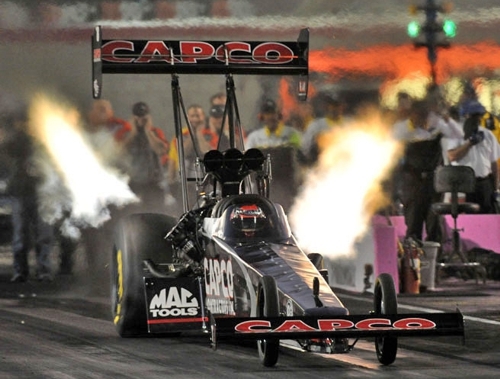 They have dominated the Full Throttle Top Fuel championship battles for the last eight years – Tony Schumacher winning six consecutive titles (2004-2009) and Johnson’s Al Anabi Racing drivers Larry Dixon (2010) and Del Worsham (2011) wrapped up the last two. Torrence placed eighth in 2010 in his first full season of competition and, after a slow 2011 start, embarked on a five-month project of building his own race team. What began in an empty shop in Brownsburg soon became a thriving race shop and a primary stop for many delivery trucks as the crew thrashed to turn this project into an on-track reality. He was sidelined for 10 races (from May to September) as the new dragster was bought, built and buttoned up in anticipation of many 300 mph runs. The car was finished in time to make its Sept. debut at Dallas, near Torrence’s hometown of Kilgore, Texas. Torrence qualified a respectable 13th and ran 301.67 mph. That was followed by an outstanding outing at Phoenix where he again qualified 13th and won the first two rounds to advance to the semifinals at Firebird Raceway for the second consecutive year. With Hogan and the crew gleaning more tuning information with each 1,000-foot lap, the qualifying performance jumped up five notches to eighth place with a 3.856-second time at 317.49 mph at Las Vegas. 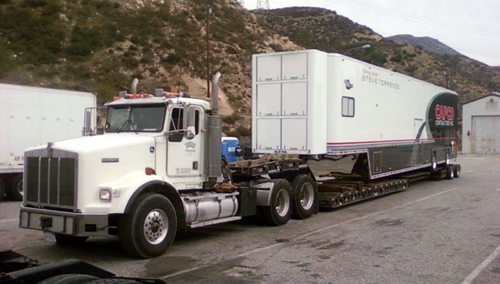 A planned race at the Auto Club Finals in Pomona, Calif. was scrubbed because the team’s trailer was too long. Torrence and the crew will launch their new year at the West Palm Beach test sessions before heading west. “Our goal is to have a good tune-up so we can go to the Winternationals and have a car that can compete for the win,” Torrence said. They hope all the new equipment and the hard work that went into it culminates in a performance that will have them in a points battle all season.